The good news is that you can start anytime and anywhere you like to grow vegetables and herbs in containers. You're the boss, so thrill to your skill as you pick from your productive pots! 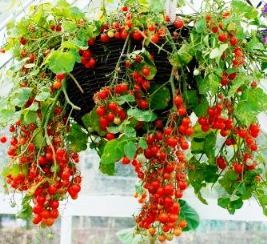 HIS page is about what are the best vegetable and herb varieties to grow in pots and the sort of pots to use. 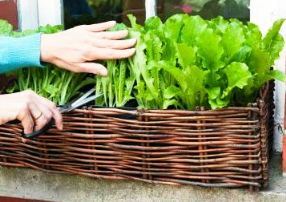 To find out HOW to GROW vegetables in containers, including drainage, soil, watering, feeding and my first-hand experience tips, see Container Vegetable Gardens. What are the best containers to grow vegetables in? Porous: A porous container is generally made from wood, clay or terracotta, or any of the hanging basket linings like wire and moss, coir or other fibrous plant material. With many wooden containers, especially troughs and planter, plastic or tin liners or pots are often used. Non porous: These containers could be made from plastic, stone, metal, ceramic/glass or concrete and hypertufa (semi-porous). The only reason you need to know that is because porous containers will lose moisture more quickly through their walls, so those plants will require more watering. Also plastic pots in hot sun have a habit of semi-frying roots, particularly in root-bound plants. I do use plastic pots for seedlings and such, but personally I don't BUY NEW plastic pots; there's plenty of old pots and buckets around that others throw out, without littering the land and sea with more plastic. Poly-whatsits grow bags are not for me. Garden centres have a wide variety of styles of containers available... some of them quite beautiful. Or you can recycle a concrete laundry sink, bathtub or wheelbarrow. It's up to you and the effect you are trying to create with your garden. Pots are addictive, believe me. You have been warned! Recycle imaginatively; try carved out pumice, hollowed logs, drainpipes, barrels, old tin cans, teapots, kettles, jugs, coal buckets etc. Keep an eye out... and a drill handy, in case you need to make drainage holes. 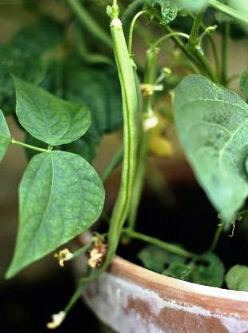 As a rule, most vegetable plants will require a container at least 25cm (6-8") deep. These smaller pots can be used to grow many herbs and salad vegetables in. Taller, more spreading or lush plants generally need bigger containers of bucket size (10 litres/2.5 gals) upwards. Large containers don't overbalance, plus more room means more roots for bigger plant growth. Search out some of the outstanding compact vegetable varieties if you can find them. What are the best vegetables and herbs to grow in containers? Because new hybrids are continually bred, it's difficult to keep up to date on the new names and attributes of all plants introduced onto the market. Plenty of hybrids have been around for ages and are favourites; and plenty of heirlooms also. Heirlooms set seeds that will predictably grow the same or 99% similar as their parent plants, whereas seeds from hybrids will often revert back to the characteristics of their parents or grandparents. So if you want to save seeds, choose heirloom varieties or well established, proven stable hybrids. Look through plant catalogues, visit garden centres and talk to others to get the best selections for your needs. The plants listed below are only a fraction of what is on offer. If you can choose plants that are labelled with such words as tolerates dry conditions, drought resistant, hardy, likes full sun, or happy in shade, and so on, then grab yourself an easy street container gardening life to suit your circumstances. Everyone loves babies — so grow baby vegetables. You don't need to let many veggies get to their big size, pick them when young 'uns. Baby carrots... yum sweet; young lettuce leaves... sow thickly and pick, pick, pick the outside leaves continually; same with spinach and Asian greens. Herbs need constant snipping to keep them compact and producing and to stop them rambling away to seed with few leaves. Finally... and this is a 'duh, slap yourself over the head' point, go for dwarf vegetable varieties where possible. 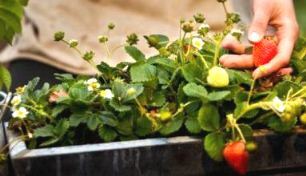 These plants are specially bred or naturally compact and cute little wonders that most often produce an enormous load of edible goodies, often out of proportion to their size.